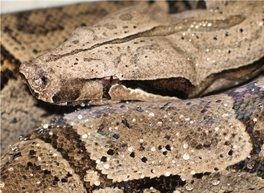 Due to the fact that the Country of Bolivia ( and Brazil ), the home range of Boa c. amarali has been closed to export since the eighties - its no wonder that Bolivian Boas are quite rare in captivity. I currently have a few blood lines originating from Joe Terry, Mark Bell & Tim Belknapp ( of which all originated from Boas that Joe Terry brought into the country in 1985 ). 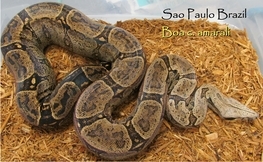 These Boas represent the best of the best when it comes to selective breeding of these rare Bolivian Boas. Some are beautifull orange & red with very pastel backgrounds while some look like the original Bolivians that came in ( Charcoal Gray with dark bellies ) and are of the "Silver Back " bloodline. As adults ( max about 6 feet ) they tend to get short & stubby, kind of like a big ball python. 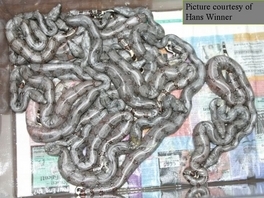 These boas are100% pure Bolivian. 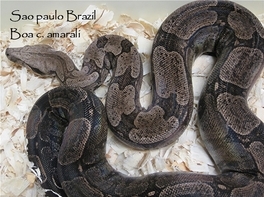 A small group of these "Sao Paulo Brazilian amarali" were obtained by a College Professor from the University of Arthus in Denmark back in the late 1980's. 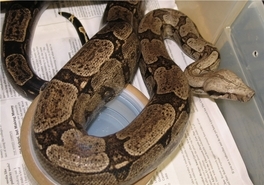 These boas were then bred by a Danish Breeder ( A grad student from Arthus ) back in the early 1990's and so were referred to in Europe as " Danish Bloodline " amarali. 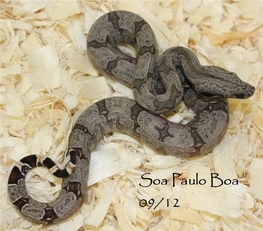 These Sao Paulo Boas are quite different from the Bolivian amarali that are already established here in the U.S. 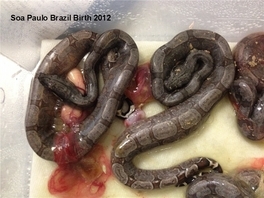 The Sao Paulo Boas are much more darker with touches of gray & brown ( as compared to the Bolivians which have more lighter colors with hues of pink & red ). 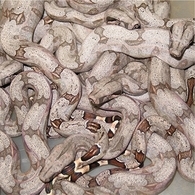 These boas are very rare & only a hand full are represented here in the U.S. My stock came from my friend Hans Winner who lives in Germany. Fortunately he was one of the few breeders in Europe to keep this bloodline pure as most crossed them into the U.S. Bolivian amarali lines. 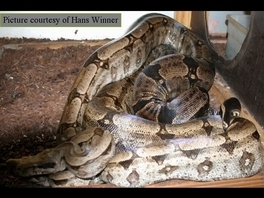 Hans produced a beautiful litter in 2007 & I was fortunate and grateful to get a pair from him. Update 2017 looks like we will not have any this year.